N-(3-Chlorophenyl)hydrazinecarbothioamide (2) was prepared by reacting 1-chloro-3-isothiocyanatobenzene (1) with hydrazine hydrate in 2-propanol, whose 1H-NMR spectrum showed its existence in a Zwitter ionic betain form. A number of 2-arylidene-N-(3-chlorophenyl)hydrazinecarbothioamides (3a–e) were synthesized by the condensation of 2 with aromatic aldehydes in absolute ethanol and in the presence of a catalytic amount of glacial acetic acid. They were reacted with 2-bromo-1-(4-bromophenyl)ethanone (4) in 2-propanol/DMF in the presence of anhydrous potassium carbonate to produce the respective 2-(arylidenehydrazono)-4-(4-bromophenyl)-3-(3-chlorophenyl)-2,3-dihydrothiazoles (5a–e) in excellent yields. The synthesized compounds were characterized by spectroscopic methods as well as mass spectrometry. The molecular modeling and atomic charges of heteroatoms in all compounds were performed using Chem3D Pro 12.0.2 software and provided an excellent tool to investigate the fragmentation pathways. 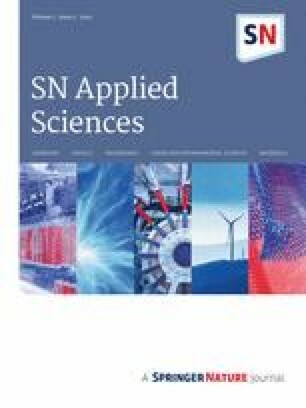 The nitrogen rule was also found to be good predictors of molecular ions and their fragmentation patterns. The online version of this article ( https://doi.org/10.1007/s42452-019-0480-x) contains supplementary material, which is available to authorized users. Thiosemicarbazones and their metal complexes are compounds of considerable interest because of their important chemical properties and beneficial biological activities. In the last decades, there has been a growing attention towards thiosemicarbazones related to their wide range of biological properties specifically as antituberculosis, antifungal, antiviral, antimicrobial, antimalarial, antiprotozoal, antitumor and anticancer agents [1, 2, 3, 4]. Several synthetic thiosemicarbazone derivatives already exist in the market such as triapine, marboran and thioacetazone (Fig. 1). Triapine is a potent inhibitor of ribonucleotide reductase activity with broad spectrum antitumor activity . Marboran is a good antiviral agent having activity against vaccinia and cowpox virus infections . Thioacetazone is one of the oldest and cheapest antibiotics used as a second line drug for tuberculosis treatment . Aldehyde thiosemicarbazones are also appropriate substrates for the preparation of five or six membered heterocyclic rings that contain two heteroatoms such on treating them with oxidizing or other cyclizing agents [8, 9, 10, 11, 12, 13, 14, 15, 16, 17, 18, 19, 20, 21, 22]. In this context, nitrogen and sulfur-containing 4-thiazolines (2,3-dihydrothiazoles) and their derivatives are considered as important classes of heterocyclic compounds due to their frequent appearance in natural products and medicinal drugs [23, 24, 25]. Also, a large number of synthetic 4-thiazolines are known to exhibit a wide range of biological activities including herbicidal, antibacterial, antifungal, ant-inflammatory, anticholinesterase, antitumor, and selective anti-proliferative effects [26, 27, 28, 29, 30, 31, 32]. Recently, we reported the synthesis of 2-arylidene-N-(3-chlorophenyl)hydrazinecarbothioamides along with their conversion to the respective 2-hydrazono-2,3-dihydrothiazoles . Continuing our interest in the synthesis of bioactive arylidene-hydrazinyl-thiazoles , we report herein their modified synthesis by reacting 2-arylidene-N-(3-chlorophenyl)hydrazinecarbothioamides with 2-bromo-1-(4-bromophenyl)ethanone in 2-propanol/DMF and in the presence of anhydrous potassium carbonate as a scavenger of the liberated hydrogen bromide, which thus offered ease of reaction work-up and isolation of products in a pure state. 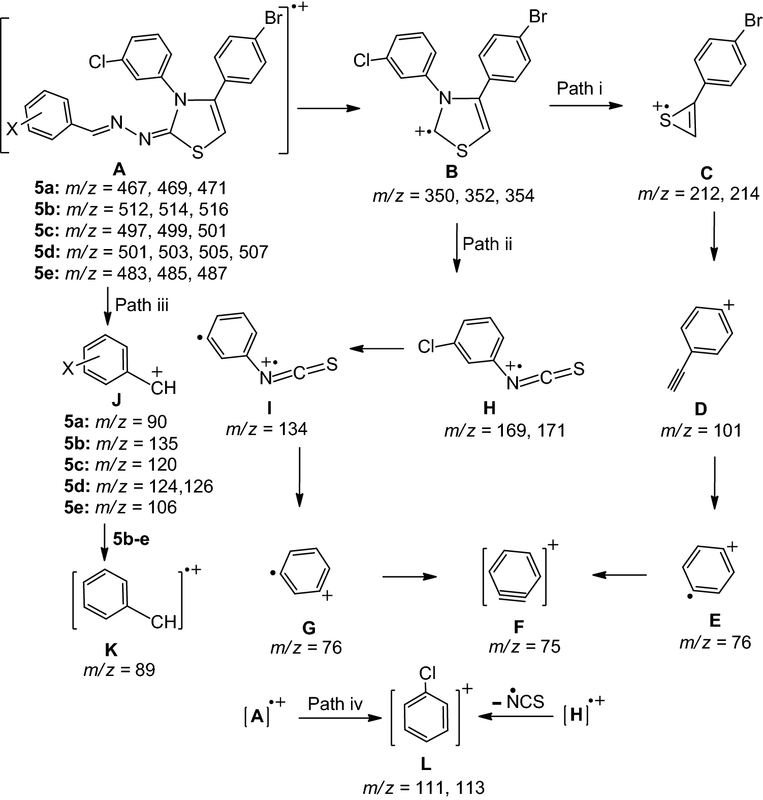 The mass spectrometry and plausible electron impact pathways of all the synthesized 4-thiazolines and their respective thiosemicarbazones were also studied. Starting chemicals and reagents used in this study were purchased from Sigma-Aldrich. Thin layer chromatography (TLC) was performed on 0.25 mm aluminum silica gel plates (60 F254, Fluka) using ethyl acetate/petroleum ether (2:3 volume ratio) and ethyl acetate/methylene chloride (4:1 volume ratio) as eluents; the spots were detected by using UV light absorption. Melting points were determined with a Mel-Temp apparatus and are uncorrected. The mass spectrometry was recorded on a Shimadzu Qp-2010 Plus GC-MS mass spectrometer with ion source temperature 250 °C, using the direct inlet probe technique at an ionizing voltage of 70 eV. FT-IR spectra were measured on a Bruker Tensor 37 FT-IR spectrometer. 1H-NMR were recorded on a JEOL JNM ECA-500 spectrometer at 500 MHz. Chemical shifts (δ) are given in parts per million (ppm) relative to TMS as an internal standard and coupling constants (J) are reported in hertz. To a stirred solution of hydrazine hydrate (100%, 5.0 mL, 0.10 mol) in 20 mL of 2-propanol, 1-chloro-3-isothiocyanatobenzene (1) (13.10 mL, 0.10 mol) was added drop-wise at room temperature with occasional stirring during 10 min. The precipitate was formed immediately, and stirring was continued for further 20 min. The mixture was filtered, and the precipitate was recrystallized three times from absolute ethanol as white crystals. Yield: 85% (1.222 g); m.p. : 119–120 °C; Lit. m.p. : 119–120 °C; Rf = 0.68 (ethyl acetate/petroleum ether, 2:3 v/v); IR (KBr): ν = 3331.96, 3279.59, 3195.80 (NH, NH2), 2935.39 (C–H), 1630.62, 1590.72, 1522.94 (C=C, C=N), 1487.31 (N–CS–N), 1253.81 (C=S), 966.14 (C–Cl) cm−1; 1H-NMR (500 MHz, DMSO-d6): δ = 4.85 (broad s, 2H, D2O-exchangeable, NH2), 7.09 (d, J = 6.9 Hz, 1H, Ar-H), 7.26 (t, J = 7.65 Hz, 1H, Ar-H), 7.53 (d, J = 6.9 Hz, 1H, Ar-H), 7.96 (s, 1H, Ar-H), 9.26 (s, 2H, D2O-exchangeable, NH2) ppm. N-(3-Chlorophenyl)hydrazinecarbothioamide (2) (2.01 g, 10 mmol) in absolute ethanol (30 mL) and glacial acetic acid (1.0 mL) was warmed on a steam bath to a clear solution and added to an aromatic aldehyde (10 mmol) in absolute ethanol (20 mL). The reaction mixture was heated under reflux for 1 h and the product that separated out on cooling was filtered, washed with a little ethanol and dried. It was recrystallized from ethanol to give the title compounds. White plates, 80% yield, m. p.: 143–146 °C; Lit. m.p. : 144–146 °C; Rf = 0.64 (ethyl acetate/petroleum ether, 2:3 v/v); 1H-NMR (500 MHz, DMSO-d6): δ = 7.22, 7.23 (dd, J = 7.6, 1.5 Hz, 1H, Ar-H), 7.36 (t, J = 8.4 Hz, 1H, Ar-H), 7.39–7.41 (m, 3H, Ar-H), 7.56 (d, J = 8.4 Hz, 1H, Ar-H), 7.72 (t, J = 1.5 Hz, 1H, Ar-H), 7.86, 7.87 (dd, J = 7.6, 2.3 Hz, 2H, Ar-H), 8.13 (s, 1H, CH=N), 10.15 (s, 1H, D2O-exchangeable, NH-Ar), 11.93 (s, 1H, D2O-exchangeable, NH-CS) ppm; EI-MS m/z (% rel. abund. ): 291.05 ([M+2]+, 16.16), 289.05 ([M]+, 43.64), 187.00 (24.45), 185.05 (67.06), 171.00 (2.74), 169.05 (4.86), 162.05 (9.62), 129.10 (31.09), 127.10 (100.00), 119.15 (51.75), 113.10 (7.80), 111.10 (23.54), 104.15 (24.96), 92.10 (15.18), 77.10 (61.31), 76.15 (12.12), 75.10 (21.53). Yellow crystals, 88% yield, m. p.: 228–230 °C; Lit. m.p. : 228–230 °C; Rf = 0.66 (ethyl acetate/petroleum ether, 2:3 v/v); 1H-NMR (500 MHz, DMSO-d6): δ = 7.25, 7.26 (dd, J = 8.4, 1.55 Hz, 1H, Ar-H), 7.38 (t, J = 8.4 Hz, 1H, Ar-H), 7.53 (d, J = 8.4 Hz, 1H, Ar-H), 7.68 (t, J = 1.55 Hz, 1H, Ar-H), 8.15 (d, J = 9.15 Hz, 2H, Ar-H), 8.21 (s, 1H, CH=N), 8.23 (d, J = 9.15 Hz, 2H, Ar-H), 10.34 (s, 1H, D2O-exchangeable, NH-Ar), 12.19 (s, 1H, D2O-exchangeable, NH-CS) ppm; EI-MS m/z (% rel. abund. ): 336.05 ([M+2]+, 6.08), 334.00 ([M]+, 20.89), 207.00 (19.49), 187.00 (10.50), 185.05 (28.72), 171.00 (11.40), 169.00 (28.26), 164.10 (4.86), 149.10 (14.52), 129.10 (31.44), 127.10 (100.00), 122.10 (4.83), 113.10 (9.94), 111.10 (29.85), 92.10 (19.35), 76.10 (39.91), 75.10 (37.67). Pale yellow plates, 83% yield, m. p.: 166–168 °C; Lit. m.p. : 166–168 °C; Rf = 0.60 (ethyl acetate/petroleum ether, 2:3 v/v); 1H-NMR (500 MHz, DMSO-d6): δ = 3.77 (s, 3H, OCH3), 6.94 (d, J = 9.15 Hz, 2H, Ar-H), 7.21, 7.22 (dd, J = 9.15, 1.55 Hz, 1H, Ar-H), 7.35 (t, J = 8.4 Hz, 1H, Ar-H), 7.56 (d, J = 8.4 Hz, 1H, Ar-H), 7.73 (s, 1H, Ar-H), 7.81 (d, J = 8.4 Hz, 2H, Ar-H), 8.08 (s, 1H, CH=N), 10.08 (s, 1H, D2O-exchangeable, NH-Ar), 11.82 (s, 1H, D2O-exchangeable, NH-CS) ppm; EI-MS m/z (% rel. abund. ): 321.05 ([M+2]+, 8.09), 319.05 ([M]+, 24.94), 192.05 (53.63), 187.00 (7.67), 185.00 (21.04), 171.00 (4.30), 169.00 (10.95), 149.10 (15.07), 134.15 (54.04), 129.10 (31.03), 127.10 (100.00), 113.10 (5.47), 111.10 (16.53), 107.15 (21.08), 92.10 (40.92), 76.10 (13.68), 75.10 (18.76). Yellow crystals, 85% yield, m. p.: 192–194 °C; Lit. m.p. : 192–194 °C; Rf = 0.56 (ethyl acetate/petroleum ether, 2:3 v/v); 1H-NMR (500 MHz, DMSO-d6): δ = 7.23 (d, J = 7.65 Hz, 1H, Ar-H), 7.35–7.41 (m, 3H, Ar-H), 7.46 (d, J = 7.65 Hz, 1H, Ar-H), 7.54 (d, J = 8.4 Hz, 1H, Ar-H), 7.70 (s, 1H, Ar-H), 8.41 (d, J = 6.9 Hz, 1H, Ar-H), 8.57 (s, 1H, CH=N), 10.23 (s, 1H, D2O-exchangeable, NH-Ar), 12.10 (s, 1H, D2O-exchangeable, NH-CS) ppm; EI-MS m/z (% rel. abund. ): 326.95 ([M+4]+, 5.38), 325.00 ([M+2]+, 23.09), 323.00 ([M]+, 32.08), 198.00 (1.56), 196.00 (3.68), 187.00 (26.32), 185.05 (71.13), 171.05 (4.24), 169.05 (9.26), 155.05 (7.60), 153.05 (21.82), 140.10 (9.03), 138.10 (16.78), 129.10 (30.99), 127.10 (100.00), 113.10 (17.22), 111.10 (50.14), 92.10 (17.12), 76.05 (11.24), 75.05 (36.07). White plates, 82% yield, m. p.: 176–178 °C; Lit. m.p. : 176–178 °C; Rf = 0.58 (ethyl acetate/petroleum ether, 2:3 v/v); 1H-NMR (500 MHz, DMSO-d6): δ = [6.81 (t, J = 6.85 Hz, Ar-H), 6.84 (d, J = 7.65 Hz, Ar-H), 6.92–6.95 (m, Ar-H), 7.19–7.22 (m, Ar-H), 7.33–7.36 (m, Ar-H), 7.55 (d, J = 8.4 Hz, Ar-H), 7.65, 7.67 (dd, J = 7.65, 1.5 Hz, Ar-H), 7.73 (t, J = 1.5 Hz, Ar-H), 8.05 (d, J = 6.9 Hz, Ar-H), the total integral of Ar-H = 8H], 8.46 (s, 0.71H, CH=N), 8.97 (s, 0.29H, CH=N), 9.98 (s, 0.71H, D2O-exchangeable, OH), 11.10 (s, 0.29H, D2O-exchangeable, OH), 10.08 (s, 1H, D2O-exchangeable, NH-Ar), 11.86 (s, 1H, D2O-exchangeable, NH-CS) ppm; EI-MS m/z (% rel. abund. ): 307.00 ([M+2]+, 19.12), 305.00 ([M]+, 52.79), 187.00 (15.10), 185.00 (41.28), 178.00 (16.59), 171.00 (7.52), 169.00 (18.10), 135.10 (20.73), 129.10 (31.40), 127.10 (100.00), 120.10 (33.49), 113.05 (9.36), 111.05 (27.95), 93.10 (15.96), 92.10 (18.95), 76.05 (10.93), 75.05 (25.71). A solution of 3a–e (10 mmol) in iso-propyl alcohol (25 mL) and N,N-dimethylformamide (2.0 mL) was treated with the solution of compound 4 (2.78 g, 10 mmol) in iso-propyl alcohol (25 mL) and anhydrous potassium carbonate (1.38 g, 10 mmol). The reaction mixture was heated under reflux for 2 h and left to cool to room temperature and the reaction progress was monitored by TLC using ethyl acetate/methylene chloride (4:1 volume ratio). The separated product was filtered, washed twice with saturated solution of NaHCO3 (30 mL) and recrystallized from a mixture of EtOH and DMF. Yellow crystals, 84% yield, m. p.: 232–234 °C; Lit. m.p. : 232–234 °C; Rf = 0.50 (ethyl acetate/methylene chloride, 4:1 v/v); 1H-NMR (500 MHz, DMSO-d6): δ = 6.69 (s, 1H, C5-H of thiazoline ring), 7.11 (d, J = 8.4 Hz, 2H, Ar-H), 7.16, 7.17 (tt, J = 8.4, 2.3 Hz, 1H, Ar-H), 7.32–7.39 (m, 5H, Ar-H), 7.44 (d, J = 8.4 Hz, 2H, Ar-H), 7.51 (s, 1H, Ar-H), 7.65 (d, J = 6.9 Hz, 2H, Ar-H), 8.17 (s, 1H, CH=N) ppm; EI-MS m/z (% rel. abund. ): 470.95 ([M+4]+, 30.98), 468.95 ([M+2]+, 100.00), 467.00 ([M]+, 72.58), 353.95 (20.53), 351.95 (70.98), 349.95 (53.28), 214.00 (12.31), 211.95 (7.94), 171.00 (4.96), 169.00 (12.73), 134.10 (18.84), 113.10 (11.65), 111.10 (36.06), 101.15 (20.87), 90.10 (97.38), 76.15 (14.47), 75.10 (36.53). Orange crystals, 85% yield, m. p.: 240–242 °C; Lit. m.p. : 240–242 °C; Rf = 0.52 (ethyl acetate/methylene chloride, 4:1 v/v); 1H-NMR (500 MHz, DMSO-d6): δ = 6.79 (s, 1H, C5-H of thiazoline ring), 7.12 (d, J = 8.4 Hz, 2H, Ar-H), 7.19, 7.20 (dd, J = 6.85, 1.5 Hz, 1H, Ar-H), 7.35–7.40 (m, 2H, Ar-H), 7.46 (d, J = 8.4 Hz, 2H, Ar-H), 7.54 (s, 1H, Ar-H), 7.87 (d, J = 9.15 Hz, 2H, Ar-H), 8.22 (d, J = 9.15 Hz, 2H, Ar-H), 8.28 (s, 1H, CH=N) ppm; EI-MS m/z (% rel. abund. ): 515.95 ([M+4]+, 29.92), 514.00 ([M+2]+, 100.00), 512.00 ([M]+, 73.29), 353.95 (11.65), 351.95 (40.33), 349.95 (35.73), 213.95 (8.27), 211.95 (7.66), 171.00 (7.61), 169.00 (18.87), 135.10 (3.83), 134.10 (17.10), 113.10 (8.47), 111.10 (26.12), 101.10 (13.37), 89.10 (47.85), 76.10 (15.56), 75.10 (24.01). Pale yellow crystals, 87% yield, m. p.: 218–220 °C; Lit. m.p. : 218–220 °C; Rf = 0.55 (ethyl acetate/methylene chloride, 4:1 v/v); 1H-NMR (500 MHz, DMSO-d6): δ = 3.75 (s, 3H, OCH3), 6.65 (s, 1H, C5-H of thiazoline ring), 6.93 (d, J = 8.4 Hz, 2H, Ar-H), 7.10 (d, J = 8.4 Hz, 2H, Ar-H), 7.14, 7.15 (dd, J = 6.5, 1.5 Hz, 1H, Ar-H), 7.32–7.35 (m, 2H, Ar-H), 7.43 (d, J = 8.4 Hz, 2H, Ar-H), 7.48 (s, 1H, Ar-H), 7.59 (d, J = 8.4 Hz, 2H, Ar-H), 8.10 (s, 1H, CH=N) ppm; EI-MS m/z (% rel. abund. ): 501.00 ([M+4]+, 32.16), 499.00 ([M+2]+, 100.00), 497.00 ([M]+, 75.17), 353.90 (20.38), 351.95 (69.76), 349.95 (54.60), 213.95 (2.81), 212.00 (2.61), 171.00 (2.27), 169.00 (5.80), 134.10 (10.42), 120.15 (71.15), 113.10 (4.99), 111.05 (14.91), 101.10 (7.72), 89.10 (14.85), 76.15 (6.91), 75.10 (11.08). Yellow crystals, 88% yield, m. p.: 246–248 °C; Lit. m.p. : 246–248 °C; Rf = 0.59 (ethyl acetate/methylene chloride, 4:1 v/v); 1H-NMR (500 MHz, DMSO-d6): δ = 6.73 (s, 1H, C5-H of thiazoline ring), 7.10 (d, J = 8.4 Hz, 2H, Ar-H), 7.20 (d, J = 6.9 Hz, 1H, Ar-H), 7.37–7.38 (m, 4H, Ar-H), 7.44–7.50 (m, 4H, Ar-H), 7.94 (s, 1H, Ar-H), 8.33 (s, 1H, CH=N) ppm; EI-MS m/z (% rel. abund. ): 506.90 ([M+6]+, 5.06), 504.90 ([M+4]+, 27.16), 502.90 ([M+2]+, 53.75), 500.90 ([M]+, 31.24), 353.95 (11.49), 351.95 (38.93), 349.95 (29.67), 213.95 (9.13), 211.95 (8.70), 171.00 (5.78), 169.00 (14.43), 134.10 (17.49), 126.10 (8.33), 124.10 (23.74), 113.10 (15.39), 111.10 (47.15), 101.15 (21.67), 89.10 (100.00), 76.10 (12.92), 75.10 (52.39). Pale yellow crystals, 81% yield, m. p.: 224–226 °C; Lit. m.p. : 224–226 °C; Rf = 0.51 (ethyl acetate/methylene chloride, 4:1 v/v); 1H-NMR (500 MHz, DMSO-d6): δ = 6.73 (s, 1H, C5-H of thiazoline ring), 6.86 (t, J = 6.85 Hz, 1H, Ar-H), 6.88 (d, J = 8.4 Hz, 1H, Ar-H), 7.12 (d, J = 8.4 Hz, 2H, Ar-H), 7.19–7.23 (m, 2H, Ar-H), 7.34–7.37 (m, 2H, Ar-H), 7.41, 7.43 (dd, J = 8.4, 2.3 Hz, 1H, Ar-H), 7.44 (d, J = 8.4 Hz, 2H, Ar-H), 7.54 (t, J = 2.3 Hz, 1H, Ar-H), 8.41 (s, 1H, CH=N), 11.02 (brs, 1H, OH) ppm; EI-MS m/z (% rel. abund. ): 486.90 ([M+4]+, 30.97), 484.90 ([M+2]+, 100.00), 482.95 ([M]+, 74.68), 353.90 (22.51), 351.90 (82.44), 349.90 (63.84), 213.95 (6.85), 211.90 (6.00), 171.00 (4.23), 169.00 (8.69), 134.10 (25.43), 113.05 (10.03), 111.05 (30.71), 106.10 (11.77), 101.10 (12.12), 89.10 (18.36), 76.10 (8.36), 75.10 (25.65). The starting material, N-(3-chlorophenyl)hydrazinecarbothioamide (2) was prepared in 85% yield from 1-chloro-3-isothiocyanatobenzene (1) and hydrazine hydrate in 2-propanol at room temperature as described [36, 37]. In the present work, its 1H-NMR in deuterated dimethyl sulfoxide differed from both reports, whereby two proton signals appeared at δ = 4.85 and 9.26 ppm, both are exchangeable with D2O and each is equivalent to two protons indicating the presence of two NH2 groups. Thus, compound 2 may exist in Zwitter ionic betain form (2C) resulting from the expected thioamide (2A) and imide-thiol (2B) tautomeric equilibrium states (Scheme 1). In harmony with their highly polarized molecular structures, these species are important starting materials in the synthesis of a variety of heterocylic compounds containing nitrogen and sulphur atoms. Although the presence of a chlorine atom at the meta position of phenyl ring in compound 2 was reported to decrease the net negative charge of the terminal nitrogen atom , the distance between chlorine and terminal nitrogen is too long in order to be significantly influenced the nucleophilic character of this nitrogen. Thus, it was condensed very smoothly with aromatic aldehydes to give the respective thiosemicarbazones 3a–e in excellent yields. 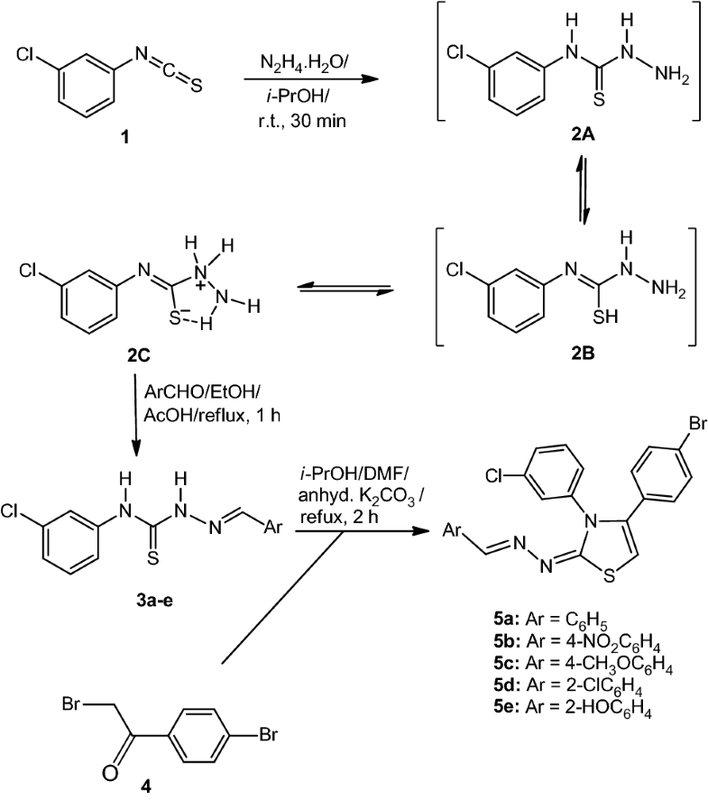 Compounds 3a–e were easily converted into 2-(arylidenehydrazono)-4-(4-bromophenyl)-3-(3-chlorophenyl)-2,3-dihydrothiazoles (5a–e) by a convenient Hantzsch condensation with 2-bromo-1-(4-bromophenyl)ethanone (4) in the presence of anhydrous potassium carbonate in 2-propanol and N,N-dimethylformamide as cosolvent. Mass spectrometry (MS) is probably one of the most versatile and comprehensive analytical technique currently available in the chemists and biochemists arsenal. Today, mass spectrometry can be used to determine molecular structures to study reaction dynamics and ion chemistry. The mass spectrometry of heterocyclic compounds has been the object of considerable study, but a few reports appeared on the mass spectrometry of thiosemicarbazones and 2-hydrazono-4-thiazolines. An interest in the mass spectrometric characterization of such class of compounds is determined by using GC-MS Qp-2010 Plus gas chromatograph mass spectrometer under electron impact (EI) mode at ionizing energy of 70 eV. The concept of charge localization at specific sites in a molecule has led to mechanistic interpretations of the fragmentation of relatively simple molecules and this principle would also appear to be valid when applied to more complex structures. Thus, we report herein the results obtained in the study of correlation between fragmentation patterns in electronic impact mass spectrometry (EI-MS) and electronic charges of the heteroatoms of some arylidene-hydrazinyl-thiazolines and their thiosemicarbazone precursors. The initial charge localization may be expected to reside preferentially at either nitrogen or sulfur atom. In this context, the electronic charges of different atoms were performed by the molecular modeling and extended Hückel semiempirical calculations using Chem3D Pro 12.0.2 software. To our knowledge, no similar study was reported about the correlation between fragmentation processes in the mass spectrometry of thiosemicarbazone and 4-thiazoline derivatives with electronic charges of their heteroatoms. According to the charges of different atoms in the thiosemicarbazone moiety of compounds 3a–e (Table 1), it is clear that the most probable point of impact of the electron beam is the sulfur atom (S10) of the thiocarbonyl (C=S) group, because it bears the most quantity of negative charge and consequently lowest ionization potential compared to N7, N9 and N11 atoms. Thus, significant fragmentations giving the most important fragments are derived from the molecular ion obtained by this impact. In all compounds the molecular ions have agreed with the nitrogen rule stated that organic compounds containing exclusively hydrogen, carbon, nitrogen, oxygen, silicon, phosphorus, sulfur and the halogens either have an odd nominal mass that indicates an odd number of nitrogen atoms are present or an even nominal mass that indicates an even number of nitrogen atoms in the molecular formula of the molecular ion. All the compounds examined yielded easily recognizable molecular ions and the principal fragmentation pathways are illustrated in Scheme 2. The m/z ratios of their molecular ions (A) are in good agreement with the calculated exact masses and are an indication of the stability of these ions. In all cases, molecular ion peaks for compounds containing an isotopic halogen appeared with appropriate peak intensities. The molecular ions underwent fragmentation in four main pathways (i–iv) to produce a number of reasonable ion peaks (B–J) as a result of cleavage around the C=S bond. All the compounds showed an intense peak at m/z = 127/129 with a relative intensity in a ratio of 3:1, corresponding to the molecular formula C6H6NCl (ion B) as shown in path i. This ion constituted the base peak and was identified as 3-chloroaniline ion. It lost ·NH2 to give the ion of chlorobenzene (ion C) at m/z = 111/113. As a consequence, the fragmentation via α-cleavage process between the C=S group and N7 atom of thiosemicarbazone moiety is considered as the most probable one. Thus, a common feature in these mass spectra is the high abundance of the 3-chloroaniline ion, because it is a particularly stable ion. Further fragmentation of ion C led to a relatively stable aromatic ions [C6H4]·+ (ion D) and [C6H3]·+ (ion E) located at m/z = 76 and 75, respectively. Also, these ions could be generated from 1-chloro-3-isothiocyanatobenzene ion (ion F, C7H4ClNS), that produced from molecular ion (A) by the fission of bond between the C=S group and N9 atom (path ii). Other well identified ions (G–J) were obtained via pathways iii and iv. Furthermore, the molecular ions of compounds 3a–e were also found to undergo fragmentation to produce the ion of 1-(3-chlorophenyl)thiourea (ion K) at m/z = 185/187 (path v). The later ion resulted from the cleavage between N9 and N11 atoms, and it may be affected by the inductive and the conjugative effect of substituent X, that is already present in the benzene ring. Other significant ion was the aniline cation (ion L), which appeared in all compounds at m/z = 92 (path vi). 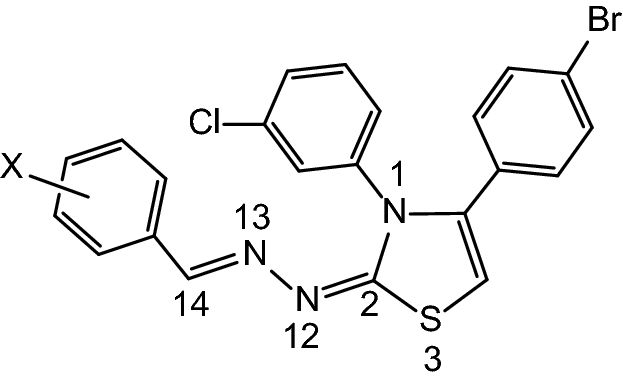 The electronic charges of different atoms in 2-hydrazono-2,3-dihdrothiazoles 5a–e are given in Table 2. It revealed that two main types of cleavage at C2=N12 and C14=N13 bonds are highly appreciated. The mass spectra of compounds 5a–e are fully consistent with the assigned structures. In all cases, intense molecular ion peaks were observed due to [M]+, [M+2]+ and [M+4]+ ions in addition to [M+6]+ in case of compound 5d containing one bromine and two chlorine atoms. The main fragmentation pathways of compounds 5a–e are shown in Scheme 3. The molecular ion (A) underwent fragmentation at C2=N12 bond to produce the thiazoline fragment (B) at m/z = 350/352/354 as [M+1]+ peaks, corresponding to the molecular formula C15H9BrClNS. 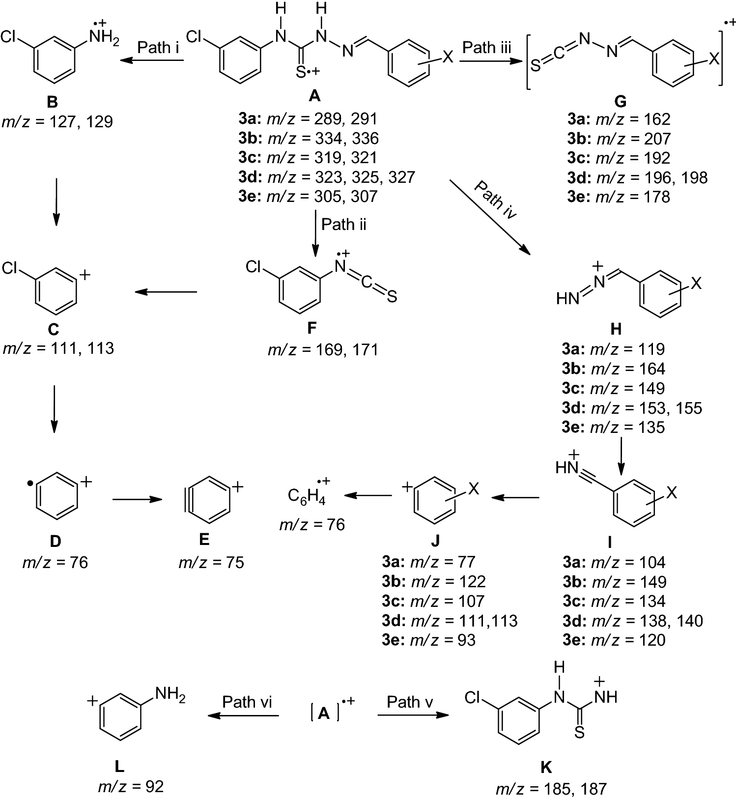 It was found to undergo fragmentation in two different pathways (path i, ii) to give the ions of 2-(4-bromophenyl)thiirene (ion C) and 1-chloro-3-isothiocyanatobenzene (ion H) at m/z = 212/214 and 169/171, respectively. The abundance of thiirene ion is very low due to its low thermal stability. It thus appears that successive elimination of ·Br and S is well established to give [C6H4C≡CH]+ (ion D) at m/z = 101. Further fragmentations of ions D and H led to [C6H4]·+ (ions E and G) at m/z = 76, which eliminated H· to give [C6H3]+ (ion F) at m/z = 75. Other significant fragmentation pathway of the molecular ion (path iii) has occurred at N13=C14 bond to afford the benzal cation (ion J) with the formula [XC6H4CH]+. Its high abundance in compounds 5a (m/z = 90, 97.38%) and 5c (m/z = 120, 71.15%) reflected its particular stability. It lost ·X to give the un-substituted benzal cation (ion K) located at m/z = 89. It was also observed that the molecular ions of compounds 5a, 5b, 5c and 5e are very stable and present generally an important relative abundance. It is surprising that they have been obtained as the base peaks. However, the 4-thiazoline 5d gave the benzal ion (K) at m/z = 89 as base peak. Finally, the molecular ion (A) could undergo fragmentation at the N1 of the 4-thiazoline ring (path iv) to produce the chlorobenzene cation (ion L) at m/z = 111, 113. The later ion could be also obtained from 1-chloro-3-isothiocyanatobenzene (ion H) by the loss of ·NCS. Several 2-(arylidenehydrazono)-4-(4-bromophenyl)-3-(3-chlorophenyl)-2,3-dihydrothiazoles were synthesized by reacting N-(3-chlorophenyl)hydrazinecarbothioamide with different aromatic aldehydes, followed by cyclization with 2-bromo-1-(4-bromophenyl)ethanone in a second step. The synthesized compounds were characterized by spectroscopic methods as well as mass spectrometry. The molecular modeling and atomic charges of heteroatoms in all compounds were performed using Chem3D Pro 12.0.2 software and provided an excellent tool to investigate the fragmentation pathways. The nitrogen rule was also found to be good predictors of molecular ions and their fragmentation patterns. The author declare that there is no conflict of interest.